Fourth Grade Nothing: Oh Canada, You Can't Do That on Television! I am constantly telling TS over at The Non-Review how much I adore Canadian television. I consider myself a lucky kid in that my folks hooked us up with Cable TV in the 1980s, while my husband didn't have cable TV growing up. It's a bummer because many of my HBO and Nickelodeon kid-show-viewing memories aren't his memories, but what can you do. We're also three years apart, so he doesn't even remember some of the same things. I mean, come on, while I was in fourth grade watching certain TV shows or listening to certain music, he was stuck in his PBS-first grade world (or "Grade 1" as they would say in Canada). 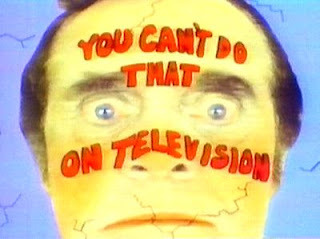 My two most favorite Canadian shows of the 1980s were You Can't Do That On Television which appeared on Nickelodeon (channel 22 from what I recall as a kid - check out this cool Facebook fan page!) and Degrassi Junior High on PBS. Today I will focus on You Can't Do That on Television and tomorrow will be Degrassi Junior High. 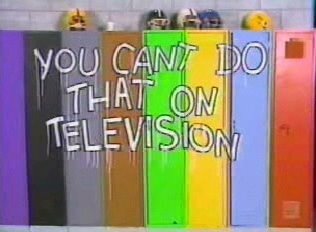 You Can't Do That on Television was a sketch comedy type show, think SNL for youngsters starting kids with super thick Ottawa accents. The show ran from 1979-1990 and was very popular and well-received. Famous scenes included kids getting green-slimed for saying, "I don't know" or doused with water for saying, "water". There was the nasty burger joint called Barth's. I always wanted to play the messed up video games at Blip's. I loved the locker scenes and who could forget the opening credits with wild images depicting The Childrens Sausage Factory? I don't even have to mention Alanis Morissette staring on the show as a kid, do I? The comedian kids I remember from the show were Christine "Moose" McGlade (the hostess with dark wavy hair had the longest run on the show) and Lisa Ruddy--the girls were slightly chubby and were known for their continuously competitive banter. I also remember Vanessa, Doug and Kevin for whatever reason. I had a huge crush on Alasdair Gillis even though as he hit puberty he took on a serious Nick Jonas look even though Nick Jonas wasn't even born back then. Here are some episodes to bring back old memories for you old-timers and show the younger folks what was Canadian cool back in the 1980s. I loved that show with a flaming passion. I'm going to have to introduce you to some other great Canadian kids shows, cause I ran the gambit on them. Ahhh I remember this show! You're right, it was great tv. Did you know Degrassi is still on tv? They're in HS now. I wonder how my own kids would react to those shows now? That was slightly before my time, but I watch another crazy Canadian kids game show called Uh Oh!, it upheld the great tradition of dumping goo on contestants. I totally remember the show, the green slime especially. I had no idea it was Canadian, just remember cringing every time someone said water! Great memories you'v brought up! Although I can say it is my daughter's dream to get "slimed!" haha! I loved it and Degrassi ahhh. I still watch it. The JR high kids are grown. Joey is on the new one with a 2 kids of his own. So is snake and a few others. Its funny yo watch the old shoes now they come on on The N here. I LOVED YCDTOT! Thanks for the flashback! I also loved Double Dare (the sliming reminded me of that). For some reason I was 100% convinced that Alasdair Gillis was Josh Hartnett. To this day I'm still not convinced they are different people. YCDToT was my absolute for favorite show!!! "What do you think is in the burgers?!" An oh so Canadian classic line. GREAT POST!!! I remember that show...I was forbidden to watch it, and got caught watching anyway one time. I had to go sit on the couch for thirty minutes. Degrassi is still on tv. My brother watches it. This was my favorite show!! I didn't get Nickelodeon where I lived, but my grandma had it--so I always got my YCDTOTV fix when I visited her. Moose rocked! Sounds like an interesting show! I did not have Nickelodeon as a kid, but my neighbors did, and I was always at their house watching this show. I don't think we knew this was filmed in another country. Ahh... I HATED this show when I was a kid, but still watched it every day. What can I say, I was (and still am) easily grossed out. Although you may recall, this is where Alanis got her start (before "Always Too Hot" or whatever that song was) and therefore has a very important place in Canadian history. I was (and still am) a HUGE fan of Degrassi... can't wait for your post on that! I loved that show! It was one of my favorites and I always looked forward to people getting slimed. I looooooooooooved this show! I used to have a huge crush on both Christine and Lisa! I always thought Les Lye was so funny! I was talking to TS Hendrick about a Canadian show called 'Today's Special' the other day..... Ever heard of that one? I've never seen a full episode of Degrassi, but dear heaven, I was SOOO a "You Can't Do That On Television" girl! I wanted to be best friends with Moose and Lisa, and I had a huge crush on Kevin, which, in retrospect, what was I thinking?! Alasdair all the way, baby! Am I the last person to know Alanis Morisette was in this? My brother and I watched this constantly back in the 80s. We loved it! Wonder if kids these days have any clue where the Nick slime idea originated?